As you may have heard me mention before, the Superbowl is pretty much the only football game I watch all year, and “watch” is a term I use loosely. This year though, I was a little more in the know, because I saw this hilarious ad about which team I should cheer for. Apparently, the Chargers were for me! Then they lost to the Broncos… So naturally, I started cheering for the Broncos! And they made it to the Superbowl! It’s amazing how much more into the game you (I) get after picking a team. We’ll need snacks and beers to keep us strong. 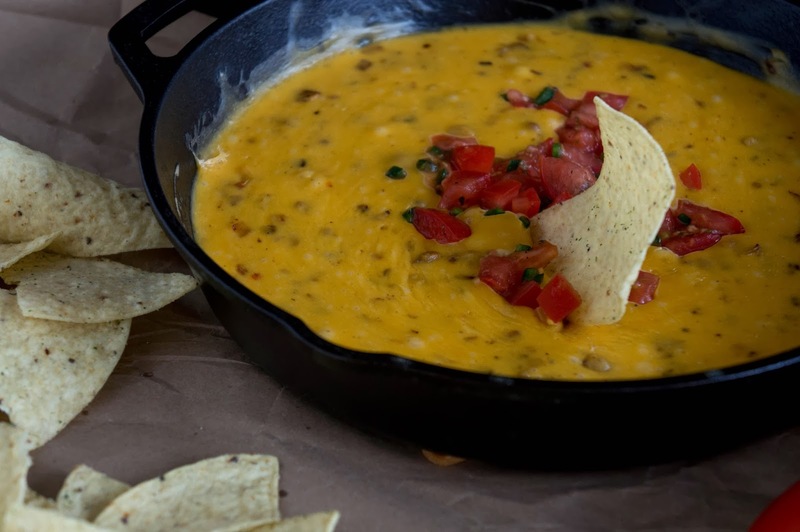 Queso fundido literally translates to melted cheese. It’s like that weird Tostitos Salsa Con Queso that you can buy in jars, except real. You can keep it totally plain, or you can add chorizo and onions like I did in this version. This is really so easy to make. If you have cheese and you have a bottle of beer, you can make this. If you have unexpected guests for the game, you can whip this up in 30 minutes tops. If you want a way to eat a pound of cheese without realizing it, this is a recipe for you. Prefer dessert? Check out these Superbowl Dessert Ideas! Grate the cheeses and toss in a large bowl with the flour. In a skillet over medium heat, cook the chorizo until the fat starts to render, breaking it up into small pieces as it cooks. Add the minced onion and continue to cook until the onion is translucent and the chorizo starts to brown, about 5 minutes. Pour into a small bowl and set aside. 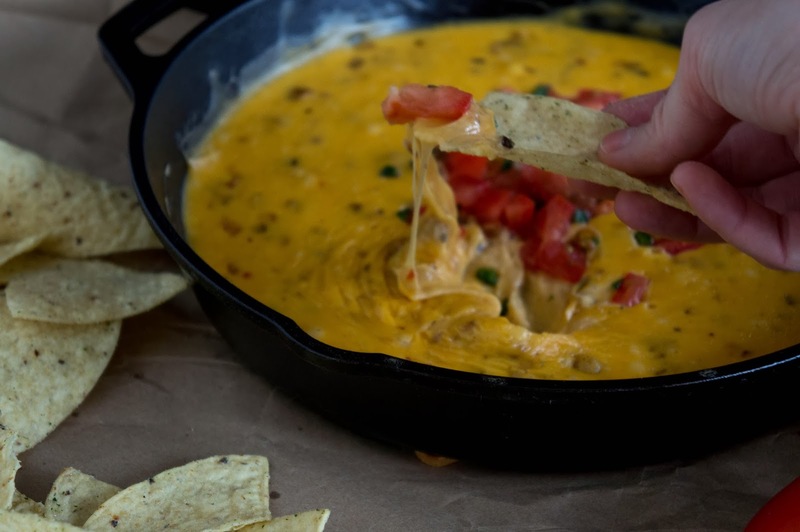 In the same skillet, decrease heat to low and pour in beer. Scrape up any brown bits that may have stuck to the pan from the chorizo and onion. Stirring constantly, add cheese 1/4 cup at a time, making sure it’s melted and smooth before adding the next bunch. Continue until all the cheese is incorporated. Stir in chorizo and onion. Top with fresh salsa (recipe below) if desired and serve immediately**. **This is best eaten immediately and will quickly solidify into a block of cheese again upon cooling. But, if this happens, don’t panic! 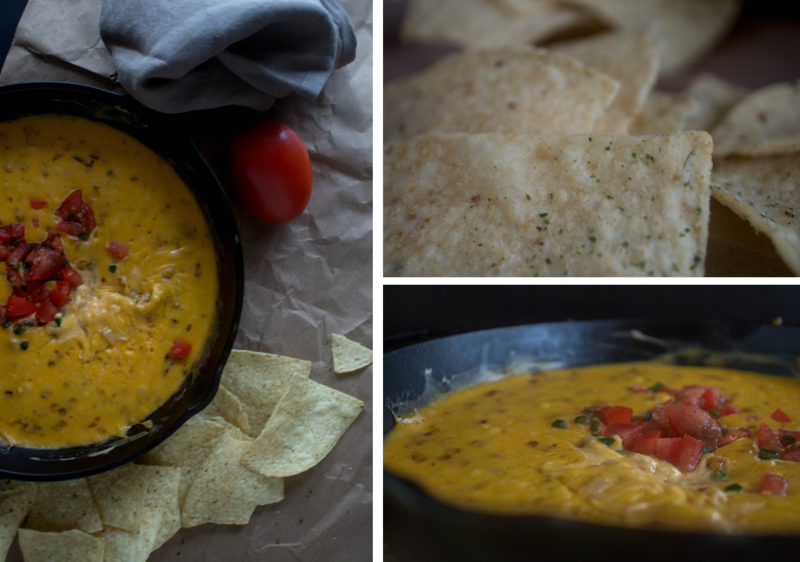 You can reheat the queso over low heat until it is hot and bubbling again. Stir and serve. Dice the tomato. Remove the seeds from the chili and mince. Combine tomatoes, pepper, oregano, lime juice, and salt and pepper in small bowl. Let sit at least 10 minutes. 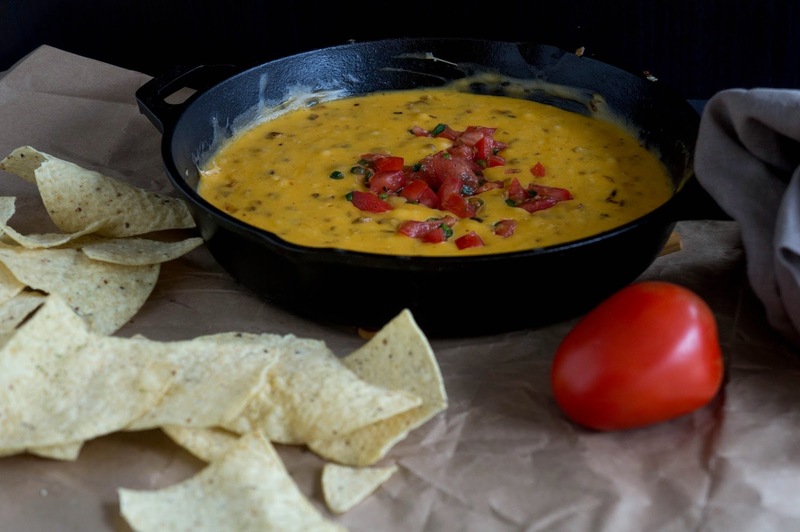 Use a slotted spoon to sprinkle salsa on top of queso fundido.